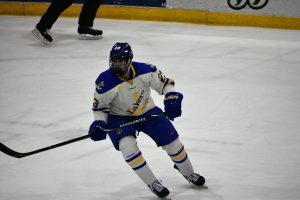 PITTSBURGH – Lake Superior State will participate in its third holiday tournament in four years under head coach Damon Whitten as they take on the Colonials of Robert Morris tonight at PPG Paints Arena in Pittsburgh. In each of the last two holiday tourneys, the Lakers have played the host in their first game, as they played Cornell in the 2014 Florida College Hockey Classic and Vermont in the 2015 Catamount Cup. This year is no different, as the Colonials are the host team of the Three Rivers Classic. Robert Morris (7-11-1, 7-7-1 Atlantic Hockey) has won the tourney three times since the Classic was established in 2012. They claimed the inaugural title and have won the last two. The Colonials have been led by seniors Brady Ferguson (10-13-23) and Michael Louria (9-13-22). Luke Lynch, a sophomore, has put up 11 goals on the year thus far. While the team has not had any success in non-conference play, these forwards have not exactly been held in check by their opponents, as each has had at least 3 points against non-conference foes. On the blueline, Robert Morris does not have much in the way of scoring defense, as Eric Israel (2-9-11) is the only one in double digit points. Between the pipes, sophomore Francis Marotte has seen the bulk of the action, as he comes into the tournament 7-7-1 overall, with a 2.87 goals against and a .909 save percentage. Senior Andrew Pikul has played in four games, sporting a 0-4-0 record, a .881 SV% and a rather husky 4.48 GAA. Robert Morris comes into the game after the same layoff most college hockey teams have had. In their last series, the Colonials swept a home-and-home with Mercyhurst, which snapped a four game skid. The winner of this game will face the winner of the Providence/Arizona State game, which is the early game. The loser will take on the loser of the first game in the early contest Saturday, while the winners from day one will compete in the nightcap Saturday for the Classic championship. Providence (10-7-1, 6-4-1 Hockey East) comes in ranked 9th in the country in the USCHO Poll. The Friars have been ranked in the poll each week since the season began – an impressive feat, especially when considering that Providence has not won more than two games in a row all year and hasn’t even done that since beating UMass and Merrimack on November 11 & 17. Leading the way for the Friars is Eric Foley (10-11-21), Brian Pinho (6-7-13) and John Wilkins (5-8-13). In net, Hayden Hawkey (10-7-0, 2.61 GAA, .906 SV%) has seen the majority of the minutes. The Friars have reportedly seen some roster changes at midseason, as two players have departed, while another has joined. Jake Ryczek, a defenseman (and Chicago Blackhawks draft pick) and Chase Zieky, a forward, have both departed the program. Ryczek has moved on to major junior, while Zieky’s fate is unknown. Meanwhile, Davis Bunz (Central Illinois – USHL) comes in. It is unclear if he will join the team for the Classic. Leading the Sun Devils are Brett Gruber (4-9-13), Tyler Busch (6-5-11) and Brinson Pasichnuk (3-6-9). Getting the call in goal most nights is Joey Daccord (4-9-4, 3.26 GAA, .911 SV%). Following the Three Rivers Classic, Arizona State will play host to their own tournament, which will be held in Las Vegas on January 5-6. The Sun Devils will face Northern Michigan in the first game and either Boston College or Michigan Tech in the second game. No current WCHA team has played in the championship game. Last season, Ferris State lost 1-0 to the Colonials before falling to Boston College 2-1 in the consolation game. In the 2013 installment, Bowling Green fell 5-0 to Boston College, but rallied to defeat Robert Morris 3-2 the next day.